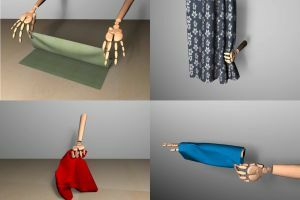 This project introduces a new simulation technique to enable detailed dexterous manipulation of cloth. 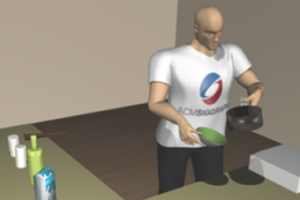 Without reimplementation or substantial modification, existing cloth simulators can only be used to approximate limited interaction between cloth and rigid bodies due to the incorrect computation of contact forces. For example, a simple scenario of two fingers pinching a piece of cloth often results in the cloth slipping out of the hand. Our technique provides a simple solution to cloth-rigid coupling using existing cloth and rigid body simulators as-is. We develop a light-weight interface so that the rigid body and cloth simulators communicate on a demand-driven manner to achieve two main goals: allow the rigid bodies to impart friction forces to the cloth and avoid unsolvable collision situations between the rigid bodies and the cloth. We demonstrate a set of basic manipulation skills including gripping, pinching, and pressing, that is frequently seen in daily activities such as dressing and folding clothes. The Graphics Lab is dedicated to research in all aspects of computer graphics, including animation, modeling, rendering, image and video manipulation and augmented reality.